Awesome wood engineering toy to teach kids about skate park physics! 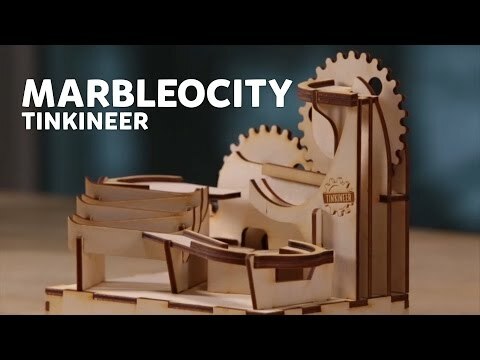 The Marbleocity Mini Skate Park is an amazing kit that provides a fun and easy way to learn the basics of engineering and physics. Once the kit is built (which takes approx. 1-2 hours), just turn the crank and watch the marble go on its adventure. What’s great about this kit is that your kids do not need any tools to build it. No glue is needed since the parts just click together, and batteries aren’t required since the marble is launched by pure hand-crank power. This kit also includes an illustrated novella that teaches about the concepts of projectile motion and centripetal force. Not Too Keen On Marbleocity Toys And Looking for Something Different? The Marbleocity Mini Skate Park is a great choice for the skateboard fan in your family.